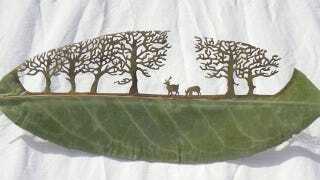 Lorenzo Duran is an artist who likes to work with leaves and knows a lot about paper cutting. He combined these two self-taught skills to create some impressive natural art. Duran spends time picking out the right leaves then washes, dries and shapes them before cutting. While he waits for the leaves to be ready, Duran draws out his design on thin paper. With paper and leaf in hand, he uses a scalpel and a very steady hand to work his magic.